The current storm system will continue to produce snow over the southern Sierra with Mammoth and points southward picking up another couple of inches overnight. The next storm looks to impact the region next weekend. Temperatures return back to normal after almost two months of above average and record setting temps. The low pressure system impacting the Southern Sierra will continue over night with additional accumulations of 6 to 12 inches over the higher elevation and some locations seeing even more. Snow will begin tapering off in the predawn hours with light snow showers continuing over the high Sierra until noon or so. A major pattern shift is underway as the high pressure ridge that has plagued the west coast retrogrades (fancy term for moves to the west) offshore. Just how warm has it been? 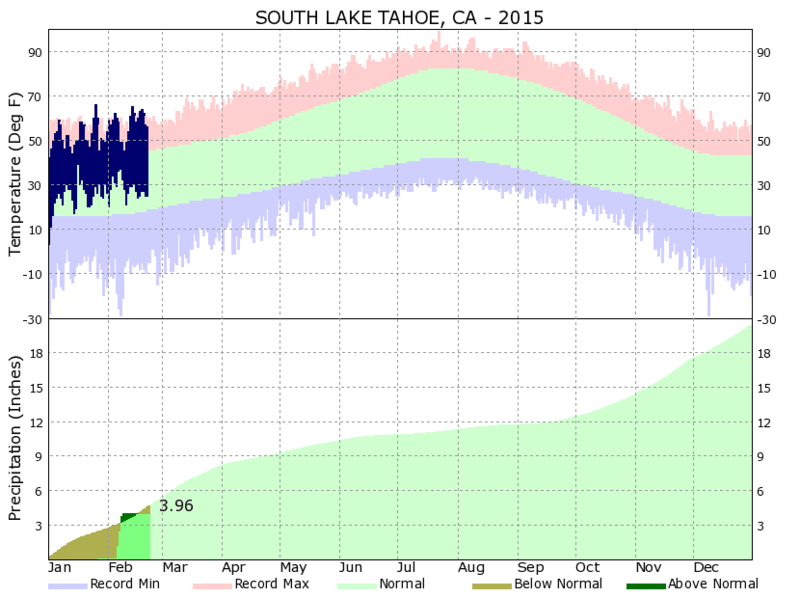 Figure 1. shows temperature compared to normal since the beginning of the year at South Lake Tahoe. The above average and record setting temperatures have caused snow melt to occur much earlier than normal. Figure 2. shows the rapid loss of snow water equivalent at the Central Sierra Snow Lab. Figure 2. 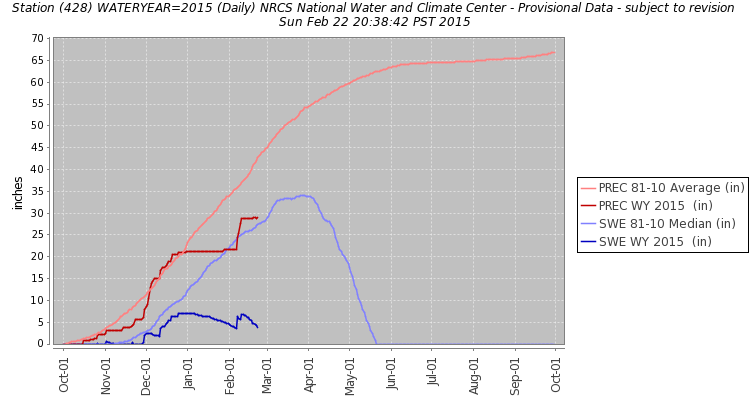 Snow Water Equivalent (blue line) and precipitation (red line) observed at the Central Sierra Snow Lab near Truckee since October 1st. The light blue and light red are the average snow water equivalent and precipitation respectively. Rapid snow melt has occurred since the beginning of the year and intensified over the last week as temperatures soared into the 60's and the sun angle continues to rise in the sky. Luckily for the snow pack and water interests, the westward motion of the ridge will allow colder air to make its way into the Western U.S., ultimately slowing the snow loss and open the door for storms to reach the Sierra. The next of these storms looks to arrive at the end of the week and into next weekend. Hopefully all of our prayers to Ullr are being heard and winter will begin to make a comeback.